Attaching clusters is a major part of the milking routine. Having a consistent routine across all milkers is important. 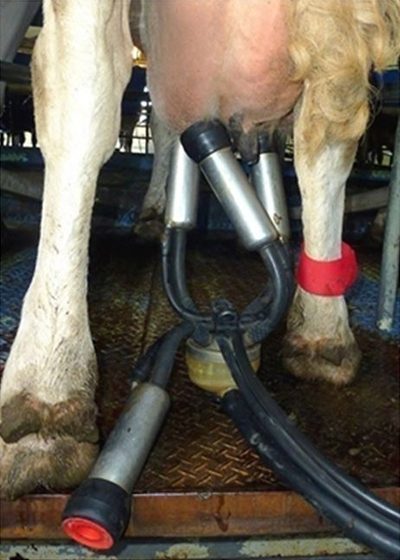 Clusters which are not attached correctly can lead to teat end damage, cup slipping, and mastitis. Reduced milker fatigue and injury. Improved cow behaviour - cows will be calmer and more acceptant of the clusters. Attachment of clusters is given surprisingly little attention considering it has a major role in the milking routine. Most milkers develop their own method without any direction. This can lead to poor cupping techniques and issues with repetitive strain injury. The aim is to find ways to change clusters consistently and reliably without unnecessary physical strain and avoiding the problems of muscle/tendon over-use. Two cupping techniques are explained here and switching between methods during milking is recommended to relieve muscle strain. Each method works on rotaries or herringbones, although there are some refinements depending on the dairy type. This method is (or should be) taught to all new milkers as a simple, easy to learn, reasonably quick method that avoids problems. It is not the fastest method but it is reliable and easier on the milker because there is much less chance of getting kicked. Use the right hand to put the cups on the right hand side row of cows (facing the exit) because it is easier to reach through the back legs. On the left hand side of the platform, use the left hand to put on the cups. This creates a change in muscle usage depending on whether the clusters are being placed on the right or left side of the herringbone. then left back - as the cow goes past. If the rotation is anti-clockwise reverse this process. For a rest try putting on the two front cups more or less at once, then the back right, then the back left with the other hand. Crossing cups to get better alignment. Once the clusters are attached, check the cluster alignment with the udder. The clusters should sit squarely under the udder. 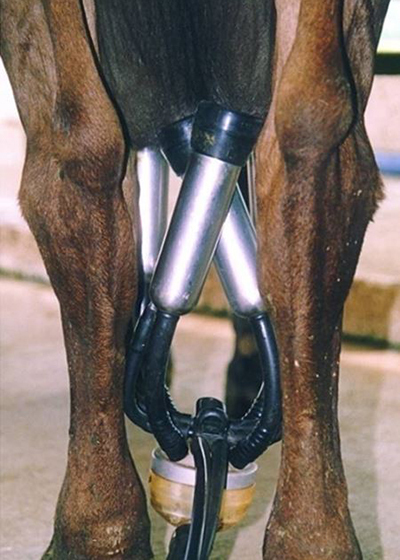 In herringbones where the clusters are attached from between the back legs, the long milk tube and pulse rubber should be in line with the cow’s backbone. Many new dairies, both rotary and herringbone, come with cluster alignment components. Using a cup plug when milking a cow with three teats. Rather than twisting the short milk tube, use a cup plug and leave the unused cup hanging – this reduces pressure on the claw. Use the cup intended for the ‘unmilked’ teat on the opposite teat e.g. if the back left teat is not milked, put the back left cup on the back right teat. This aligns the cluster better for milking.